The report "Solar Encapsulation Market by Materials (EVA, PVB, PDMS, Ionomer, TPU, Polyolefin), Technology (Single/Poly-crystalline Silicon, Thin-film (CDTE, CIGS, a-Si), Applications (Construction, Electronics, Automotive): Global Trends and Forecast to 2018" defines and segments the global solar encapsulation market with analysis and forecasting of the global revenue. Browse 104 market data tables and 37 figures spread through 267 pages and in-depth TOC on “Solar Encapsulation Market by Materials (EVA, PVB, PDMS, Ionomer, TPU, Polyolefin), Technology (Single/Poly-crystalline Silicon, Thin-film (CDTE, CIGS, a-Si), Applications (Construction, Electronics, Automotive): Global Trends & Forecast to 2018”. Solar encapsulation market is mainly driven by growing demand of solar PVs. Also, in order to fulfill the global electricity demand for upcoming years, solar applications are expected to be the most economical and eco-friendly option. There is a huge demand from the Asian countries which created a big opportunity for global encapsulant manufacturers. The market has been estimated from demand side. This report breaks the market into smaller product segments. In order to provide a deeper understanding of the competitive landscape, the report profiles the 16 companies in the solar encapsulation market which combines materials as well as technology companies. Solar encapsulants manufacturers are constantly trying to modify their products in order to increase their market share, which in turn helps them to bag bulk supply contracts. Formation of distribution agreements and new products launched are some key strategies being followed by leading industry players to increase their market penetration in various regions. The report forecasts revenue of the global solar encapsulation market and its various submarkets with respect to four main regions such as North America, Asia, Europe, and Rest of World (ROW). The Rest of the World (ROW) includes Middle East, Australia, and Africa prominently with other regions excluding Europe, Asia, and North America. 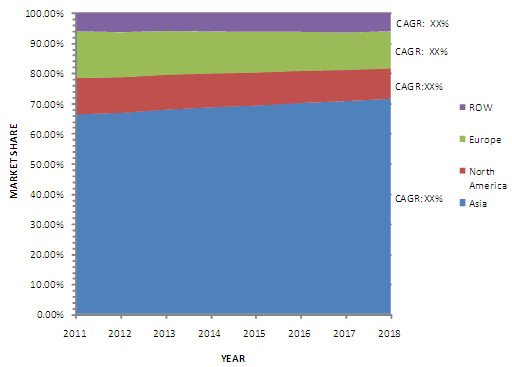 Solar encapsulation market will grow from an estimated $834.2 million in 2013 to $1,357.2 million by 2018, with a CAGR of 10.2% from 2013 to 2018.